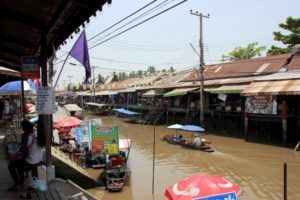 The Amphawa Floating Market is located in central Thailand, approximately 50 from Bangkok. 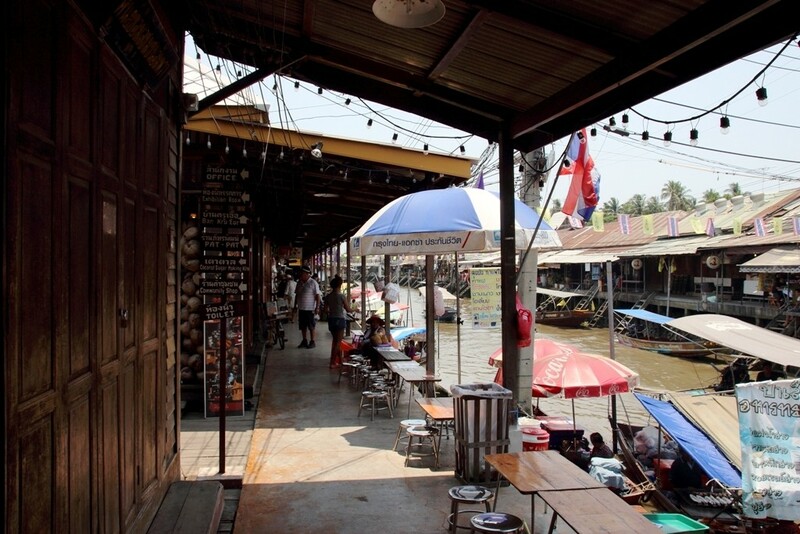 It takes place along the waterfront walkways of Amphawa Canal, which is a small tributary of the Mae Khlong River. It is arguably the most authentic floating market in Thailand with a long history dating back to the mid 17th century. 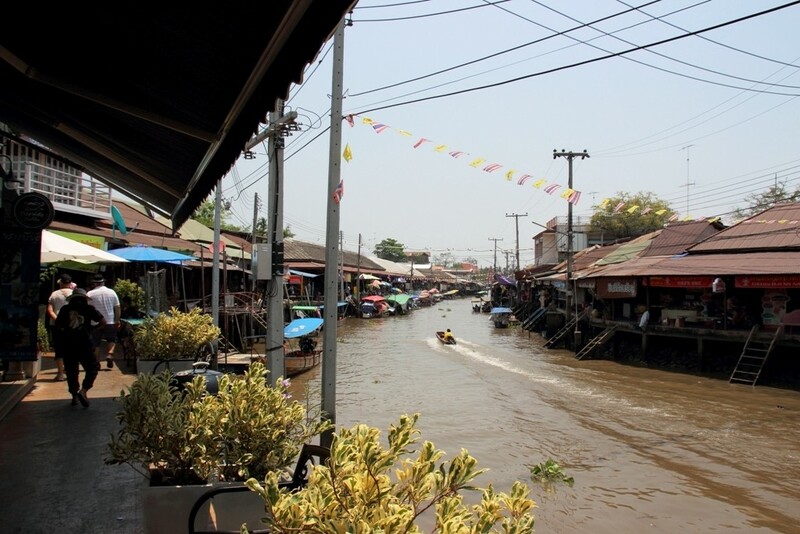 Amphawa may not be as large as Damnoen Saduak but it is definitely more authentic. 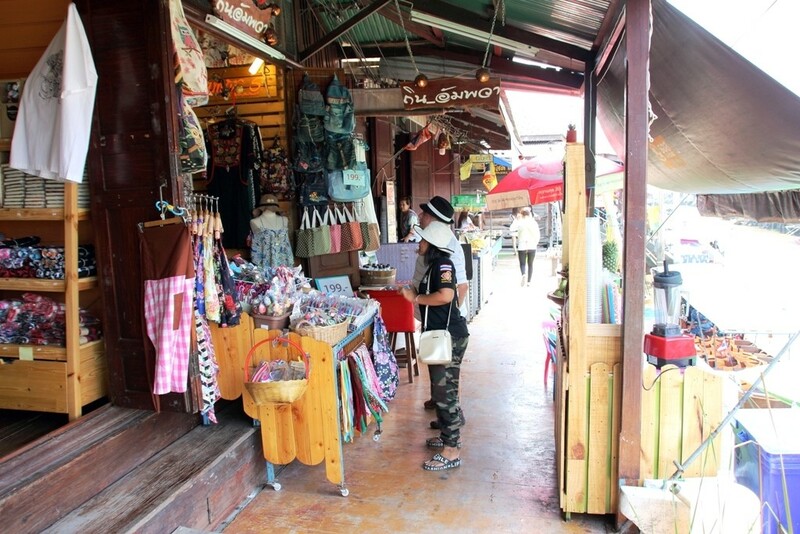 It has been commercially developed, but the old wooden houses and shop fronts have been retained. 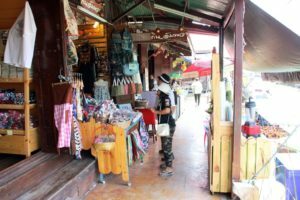 This adds to the authentic charm of the market. Although it may not be as popular with the western tourists as some of the other floating markets closer to Bangkok but it is certainly popular with the locals. If you visit the Market on a weekend, you get the feeling that half the Thai residents of Bangkok have decided to join you. 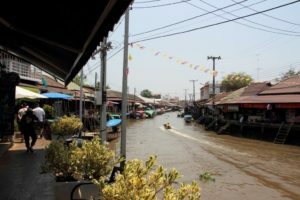 On both sides of the Canal, can be found charming old timber cottages and shops selling souvenirs, food, drinks and ice-creams. 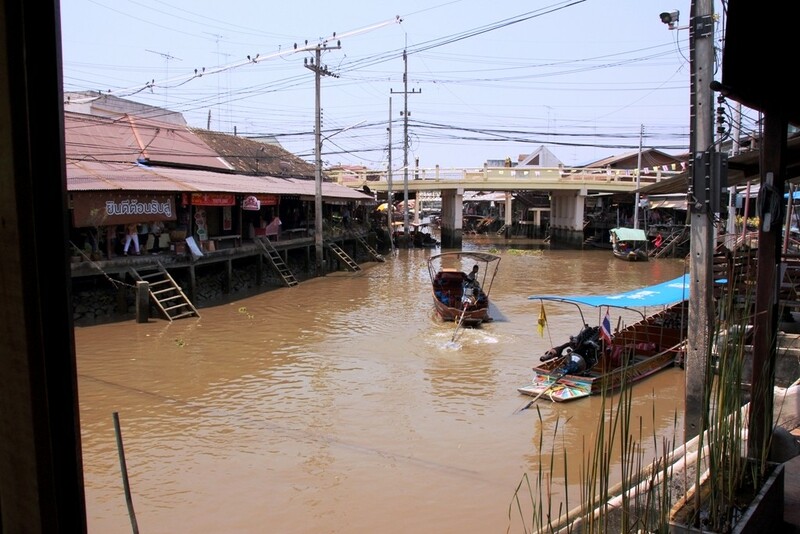 When we take you on a tour to Amphawa, we like to settle you in to a motel close to the river. We then take you on a leisurely evening stroll along the walkways beside the river. 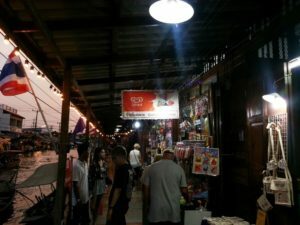 It is definitely best to plan this on a weekday and not on a Friday night or weekend, as it will be so crowded. 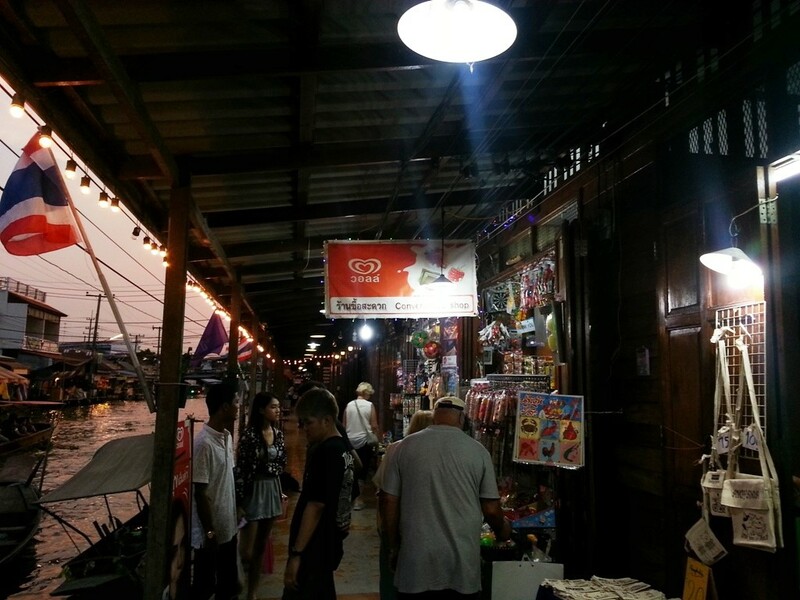 The first time we visited, we arrived on a Friday night. Big mistake! we spent the first two hours in traffic trying to get a parking spot and by the time we finally managed to get to a restaurant most choices on the menu had sold out. 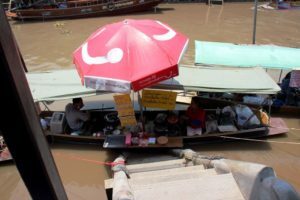 For food you have two options. You can sit on a chair and table at one of the more western style eating houses or you can do it the traditional way. Perch yourself on one of the many narrow steps leading down to the water’s edge and eat the freshly cooked food from one, or several, of the many boats waiting to serve you. 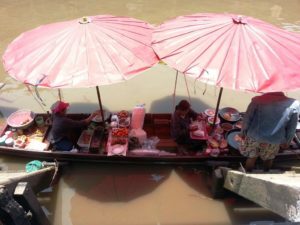 Once you have eaten your full, take one of the many longtail boats and explore the surrounding canals and rivers. Although it is a little more expensive than taking the cheaper public boats, we prefer to book a private boat just for our group. 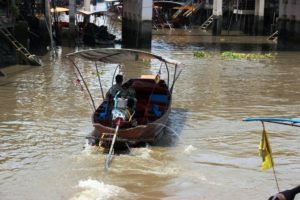 This avoids a lot of waiting time as on the larger tour boats there is a lot of time spent waiting for the boat to be full before leaving and then waiting for other passengers at each stop. 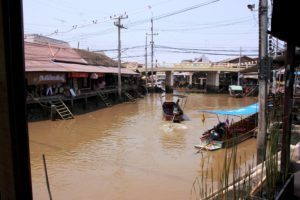 The above video was taken by our tour guide Phat on a visit to Amphawa Floating Market in April 2016. 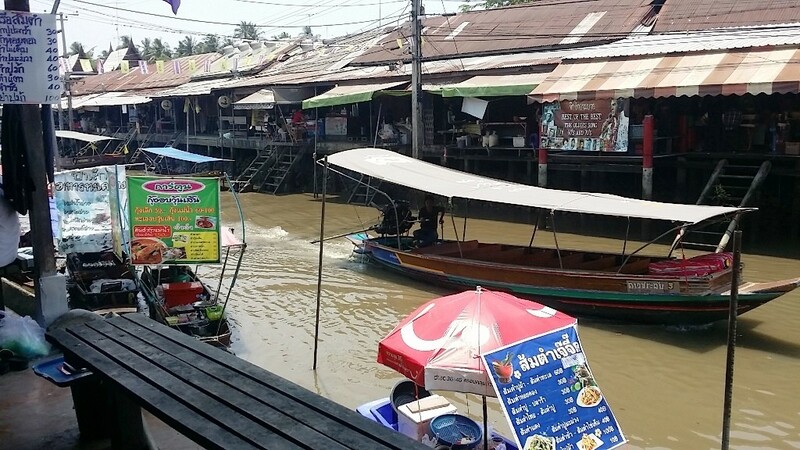 It shows an interesting view of the shops on the sides of the canal. 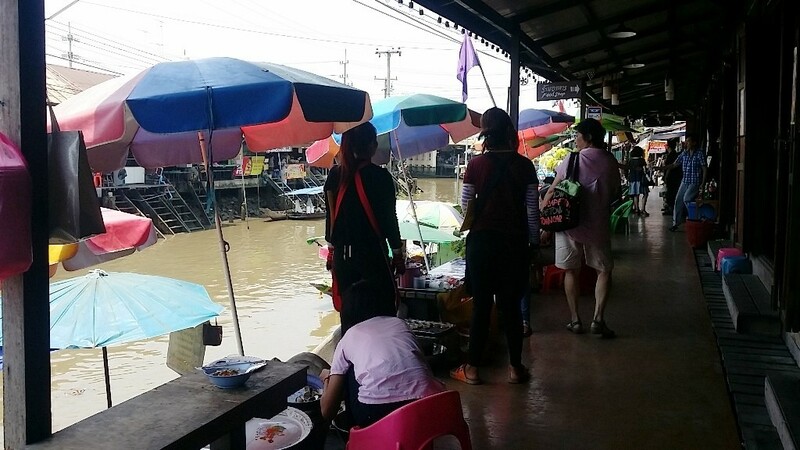 The above video was taken by me from the same boat at the same time as the video Phat took but shows a completely different view of the market as it was taken from the front of the boat. 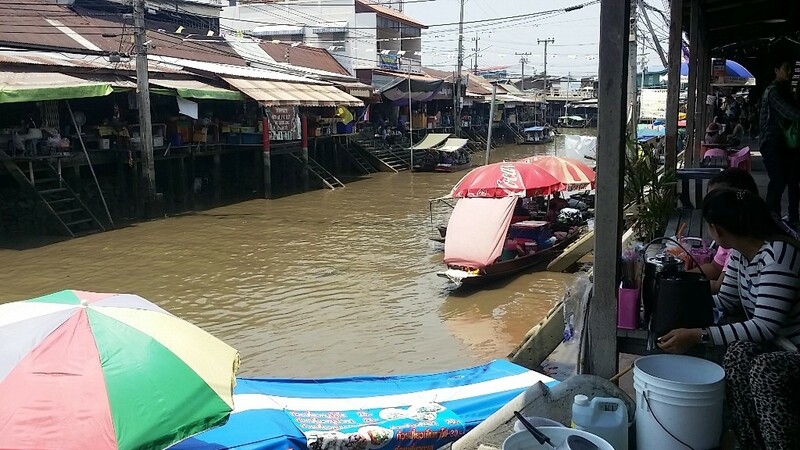 Taken on the same day as the previous two videos, this one shows the section of the river close to the Amphawa market.